This is the first episode I began to feel like the old Bones of the past seasons was back. By the way, in my life I’ve only purchased two TV series in DVD form: The X-Files, and Bones. Patiently too… I waited until the second season of Bones went down to $15.00. The episode opens with Booth hanging out with his son at a park. There’s a bit of boneheadedness when Seeley says that a spiral-thrown football is more beautiful than a sunset or the Mona Lisa. I suppose that falls under personal preference, but I sure as hell would not pass it down to my son that I’m a moron that places a misshapen ball before the aesthetics of art or nature. Anyway, I’m not going to be one of those silly people that reads too much in a TV moment that shows fake interaction between a father and his son (even though I just was), especially when I know parenthood is filled with erroneous sound bites that are great opportunities for a child to make up her own mind about real things. When I was a child my father was enraged after a visit to my grandparents because my grandma said something derogatory about the bible. I had to look away so he would not see my lack of empathy with his feelings. While I didn’t exactly agree with my grandmother, at that age I had already began to ponder the value of a book that illustrated women as chattel constantly used for begetting, or as extensions of men right from the beginning. In the end, I still think the bible is one of the most interesting works of fiction I have ever read, but enough of that. There’s a bit of character exposition I love about Bones, and it’s when the squints and Booth get together to discuss a case, and the former will name drop some Latin species or name for something which invariably goes over Seeley’s head. Cue in his clueless look followed immediately by their explanation using the common name for things. If that doesn’t make you open up a book to study Latin or look things up on the Internet (the sort of things that expand your brain and your brain only, that is), or develop a thirst for knowledge, then… well, it does that for me. 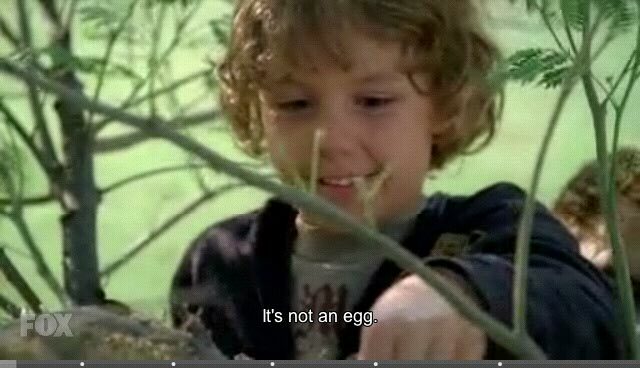 For example, when Parker finds the human bone in a Corvus Brachyrhynchos (American Crow) nest, I felt compelled to find out more about that bird. That it feeds on carrion is true, although it’s only a small part of its diet. There are other interesting facts about it, but moving on. Decomposed body parts are fun to find! I was also extremely diverted by the whole Parker-must-be-traumatized bit. When I was a little girl my thirst for snails and puppy dog tails was equal to my sugar and spice components, so Booth’s distress over his son possibly being emotionally scarred over the rotten finger was touching, while Parker’s smirky, delighted attitude reminded me of myself. The whole psycho babble about children’s brains not being able to process death as an end is pure hooey, of course. The part of Zach was played by Mr. Starret, Brennan’s oldest star student. Another favorite part of all episodes is when the body of the victim is found, but in this case it was hardly believable that Booth did not know that possums go into a false sleep, therefore originating the phrase “playing possum”. That bit seemed too “let’s educate the viewer”, which is something annoying and unfortunately ubiquitous to any TV show that displays any amount of real science. I felt the same when Hodgins identified the murder weapon as Canis Lupus Familiaris. Anyone with half a brain knows that “canis” can mean dog, and Booth’s character certainly has more than half a brain. 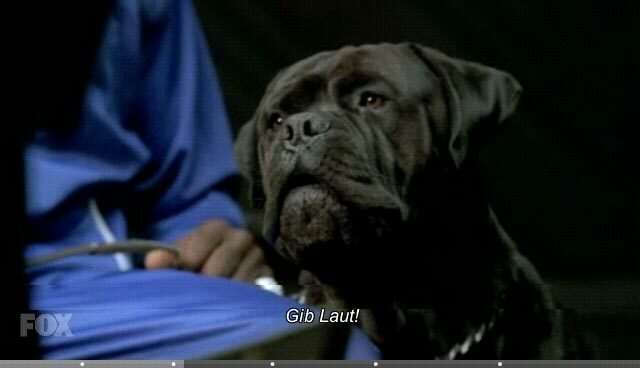 Another episode highlight was Schatzi, the beautiful Cane Corso Mastiff? of a drug dealer who was a murder suspect. Schatzi (which means “treasure” in German) had been trained to obey commands spoken in German. That’s exactly what I dreamt of doing back when I wanted two Rottweilers as doggy companions… before my life was invaded by three cats. Schatzi being ordered to bark. I wanted to come up with a secret command word in German that meant “kill home invader now by chewing his throat to bloody flesh threads”. Ah, to be young and to have dreams of your dogs as weapons. And all that fun and memories within the first thirteen minutes of the show. The rest was just as enjoyable.